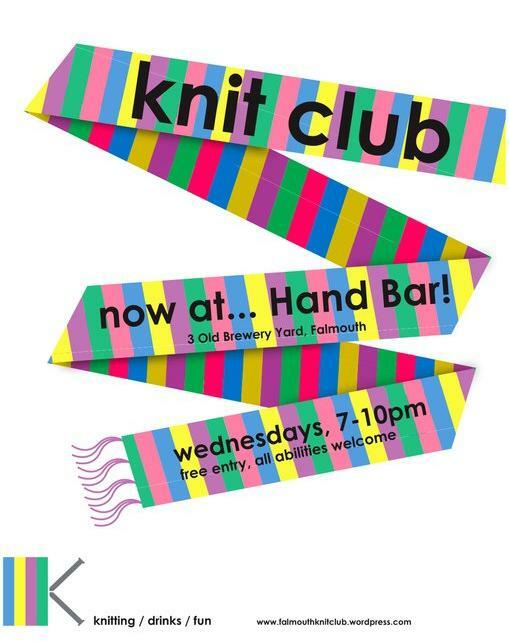 Falmouth Knit Club @ Hand Bar Falmouth Knit Club  - - It's Free! : WoolBasket.co.uk, Wool Basket Online. All you need for Knitting, Wool, Yarn and Haberdashery supplies. Welcome to the Falmouth Knit Club! For the real thing, come join us at HAND Bar, 3 Old Brewery Yard, Falmouth, TR11 2BY (at the top of the old High Street) every Wednesday, 7-10pm. Whatever your knitting ability (help is available for beginners! ), you’re sure to have fun. You can even enjoy a sneaky pint or glass of vino with your knitting!